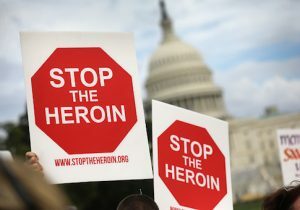 President Donald Trump announced plans on Thursday to combat the surging opioid epidemic in America, beginning a move that would free up resources and loosen regulations to help combat drug deaths, but falling short of his August promise to declare the the epidemic a national emergency. "This crisis of drug use, addiction, and overdose deaths in many years, it's just been so long in the making. Addressing it will require all of our effort, and it will require us to confront the crisis in all of its very real complexity," Trump said. Trump will instruct acting Secretary of Health and Human Services Eric Hargan to designate the opioid epidemic a "public health crisis," stopping short of designating it a "national emergency," as was recommended in July by the President's Commission on Combating Drug Addiction and the Opioid Crisis, a blue ribbon panel chaired by Gov. Chris Christie (R., N.J.). The public health crisis designation, once approved, will allow for a number of federal agencies to target the crisis. HHS will be permitted to make temporary appointments of specialists, reducing bureaucratic red tape for hiring. The Department of Labor will be able to issue "dislocated worker grants," which will help workers displaced by the crisis. Additionally, the designation will permit several medical policy shifts. It will expand telemedicine services, making addressing substance abuse in rural areas easier. And it will allow the shifting of resources to better address substance abuse among those with HIV/AIDS. "As Americans, we cannot allow this to continue. It's time to liberate our communities from the scourge of drug addiction. It's never been this way. We can be the generation that ends the opioid epidemic. We can do it," Trump said. The designation will not add additional federal funds to the fight against opioids. While the Public Health Emergency Act is associated with a Public Health Emergency Fund, Congress has not funded that pot in the last several years, a senior administration official said. That official said there would be an ongoing conversation between the White House and Congress on appropriating for that fund going forward. Even given the lack of more funding, one expert was positive about the overall strategy. Carrie Wade, harm reduction policy director for the R Street Institute, spoke approvingly about the better access to telemedicine and treatment of those with HIV/AIDS. "I think declaring a public health crisis, that's accurate. It's not as big of an event as if it were a national emergency, but I think we're headed in the right direction there," Wade said. Drugs, especially opioids, represent a serious threat to Americans' health and safety. Of the 64,000 overdose deaths in 2016, 78 percent were caused by fentanyl, heroin, or prescription opioids. Drug poisoning is the number one cause of injury death in the United States, having outpaced homicide, suicide, and car crashes since 2011; it is the leading cause of death for Americans under 50. 13.6 percent—almost one in seven—of Americans have abused prescription opioids at some point in their lives. The public health crisis designation is just the latest in the Trump administration offensive in the war against opioids. Since January, the White House has allocated more than $1 billion in funds for addressing substance abuse. The Food and Drug Administration has imposed new restrictions meant to limit overprescription. Law enforcement agencies have been key in the fight as well. The Department of Justice has targeted drug dealers, including the first-ever indictments of Chinese nationals in an opioid trafficking case. And on Saturday, the Drug Enforcement Agency will host another national prescription drug take back day, where Americans can drop off unused prescription drugs with law enforcement officials. The last one, in April, brought in 450 tons of unused drugs. In his speech, Trump promised further action to combat opioids in the coming months, including "some very major lawsuits" against individuals and companies complicit in the crisis.